Religious buildings can be difficult to re-purpose. As congregations in New Hampshire dwindle in size and number, these community landmarks are in danger of being demolished. The wrecking ball recently claimed Dover's St. Charles Borromeo Church and Peterborough's St. Peter Church. Others in Concord and Laconia await final decisions. When the Sacred Heart Church on Pleasant Street in Concord went up for sale, it was far from guaranteed that the building would be saved. Local developer Jonathan Chorlian purchased the building and devised a plan to convert it into ten condominium units. Chorlian feared that otherwise, the building could have been leveled for parking. Accepting the award in Concord, Chorlian acknowledged that this rehabilitation was an opportunity to respect the French Canadian immigrants who built the church in the throes of the Great Depression. 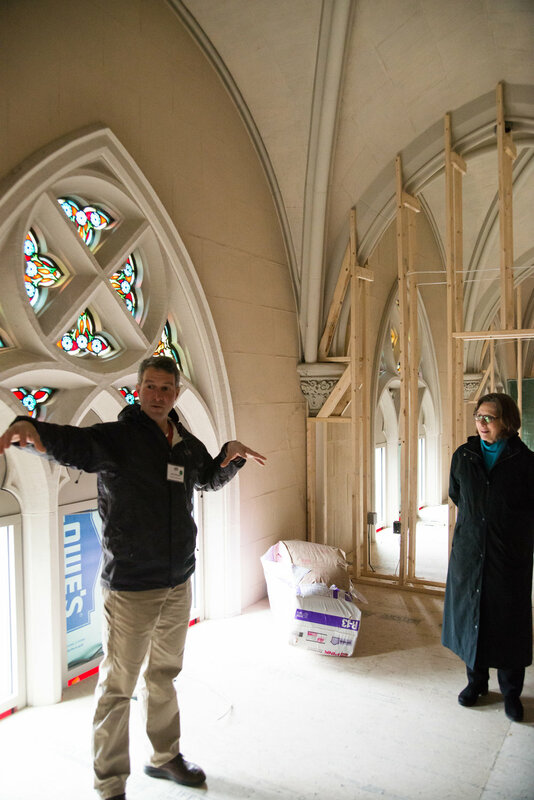 "When I take a step back and think about Sacred Heart now, what I often think about is the commitment and faith of the parishioners who built this magnificent building...and the extraordinary gift they gave to us and to Concord. Think about it - not one person who gave money to for this building – with its Gothic detail and spectacular variegated sandstone - is still alive today. Yet every single day people still enjoy and are inspired by this building." The conversion adds further life to downtown Concord (which won its own Preservation Achievement award in 2017). It also provides a case study for how other religious buildings can be reused and appreciated by future generations. Despite the complex architectural challenges that come with converting a large sanctuary into housing - as well as meeting the stipulations put on the building by the Catholic Church (no religious iconography was to be visible), "It was one of the great joys of my life to do this project," said Chorlian. After eighteen months of construction, Concord’s Main Street re-opened in November 2016. This award applauds the project leader’s methods and goals to enhance downtown’s economic vitality, improve safety for all, promote the historic fabric and character of Concord, increase ADA access to storefronts, and create new spaces for outdoor dining and public gatherings. Using a mix of public and private dollars, a competitive federal transportation grant, and guided by historical research, the team chose materials and designs that harkened back to various eras in downtown Concord’s history. Some of those symbolic, yet functional, designs include: the granite pavers in the center lane, which reflect both early paving material and recall the former streetcar track; re-introducing brick and granite curbing first used in 1867; adding street lights based on designs from the 1920s; planting street trees in numbers not seen since the mid-nineteenth century; and accent lighting the 1892 Memorial Arch and 1983 Iron Arch. Other improvements include kiosks with maps and histories, contemporary benches and bicycle racks, and enlivening public art. Already, the redesigned space has attracted new residential and business investment. The thoughtfully redesigned eight blocks embraces the “complete street” model and serves as a statewide example of how a collaborative effort yields spectacular results.